It was an 11 a.m. start time Tuesday for the game between the Connecticut Tigers and Tri-City ValleyCats, so it was one of those games where you wake up early, show up early and just play. Ben Verlander, back for his 10th game with the Tigers' Class A Short Season affiliate after being moved from Class A West Michigan in order to get more at-bats, didn't take batting practice or even attempt to swing a bat until he stepped into the on-deck circle in the second inning. "It was an early wake-up call for all of us," Verlander said. "I got up at about 7:45 and needed to head straight there. In that situation, you just get there and get the game going right away and hope you start well." As it turned out, those limited practice hacks on the sidelines were all he needed. Verlander set career highs with two home runs and seven RBIs and finished 4-for-5 with four runs scored Tuesday to help Connecticut crush Tri-City, 18-4, at Joseph L. Bruno Stadium. The right-handed-hitting outfielder singled in his first at-bat in the second inning before popping up for his only out to conclude the third. An inning later, he stepped up with the bases loaded and three runs already on the board in the frame for the visiting Tigers and knocked a two-run single. He came around to score on a two-run double by Domingo Leyba to conclude a seven-run fourth inning that put Connecticut ahead, 9-2, early. "That's Exhibit A of hitting being contagious," said Verlander, brother of 2011 AL MVP and Cy Young Award winner Justin Verlander. "We had some problems in the first few innings, but then a couple of guys get on and everyone starts hitting. It's one of those things in baseball you really can't explain, but before you know, you've got a seven-run inning like we had." Verlander, who entered the day with only one home run this season and five in his career since being drafted in the 14th round last year, turned on the power in the sixth. Batting again with the bases loaded, he smacked a splitter from ValleyCats left-handed reliever Sebastian Kessay over the wall in left. "When you come up with the bases loaded, you just want to get the ball elevated, get it to the outfield and drive in one run. Anything more than that is really just a bonus," he said. "He came back with the same pitch in the same spot, and I knew I hit it well but thought it was a little too high. Luckily, it just snuck out." Following a walk in the eighth, the former Old Dominion slugger made the most of his last chance in the ninth, sending a 1-0 fastball from left-handed reliever Kevin Ferguson again over the wall in left. With the four hits on the day, Verlander tied a career high, first established April 16 this year with West Michigan, while his four runs were also a career best. Before plating seven Tuesday, his high for RBIs in a single game was only three. All of those numbers make the formula for what was easily the 22-year-old's best day as a professional. "Yeah, I think it is," Verlander said. "It's a great feeling to come up with so much confidence in those third and fourth at-bats. It really eases your mind, and that confidence is what really helped me have a big day. I'd definitely say it's the best I've felt on the field as a pro." There was a time when 2014 didn't quite feel like it was going his way, however. Verlander began the year in the Midwest League, where he making his full-season debut. He had a .311 average through the first 15 games of the season but saw that number plummet to .217 by the end of May, no thanks to a .187 average in the season's second month. 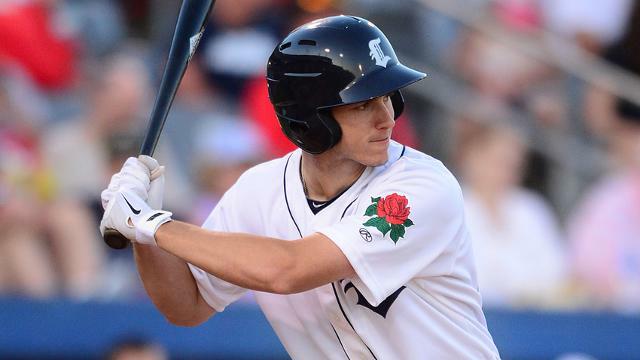 By June, the Whitecaps cut his playing time, and the former starting right fielder played in only five games through the first half of the month. With the short-season schedule kicking off on June 13, the Tigers had a decision to make -- continue to let Verlander wallow on the West Michigan bench or move him back to Connecticut where he played 67 games in 2013 and could get more playing time. They chose the latter, and to his credit, Verlander gladly accepted the reassignment. In 10 games, he is 13-for-38 (.342) following a mechanical adjustment that sees him start each at-bat with the bat on his shoulder in an attempt to better control his hands. And he hopes that tweak, along with more playing time, has him back on the right track. "There are a couple of different ways you can look at something like that," he said. "One is, 'Oh, look at me -- I'm being demoted.' But no one's going to feel bad for you when you think like that. I started well up there but hit a rough spot, and then I wasn't playing every day. So when they decided to send me here, they said, 'We need you to get some at-bats.' And that's where I'd rather be, somewhere I'm getting my at-bats. So far, it's working out for the best." ValleyCats first baseman and Astros second-rounder A.J. Reed finished a triple shy of the cycle, going 3-for-4 with three RBIs in the loss.